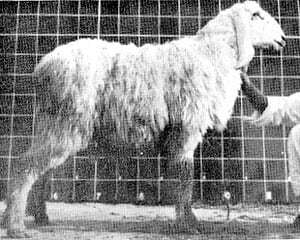 Kooka sheep breed originated from Pakistan. They are raised for meat and wool production. They produce about 3 kg of white wool per year. They have a very heavy head with a wide forehead, long hanging ears, small horns, and a medium sized mouth. The females produce about 1 kg milk daily.